Weight loss is hard stuff. I’ll never be the person who drops a ton of weight and suddenly forgets how difficult it was to get there. Trying to become healthier, especially if you were never really the picture of health to begin with, often tests you in more ways than just physically. The progress is never linear, daily life often interferes, motivation waxes and wanes, and sometimes, even if you’re doing everything the experts say you should, you still can’t lose a pound. 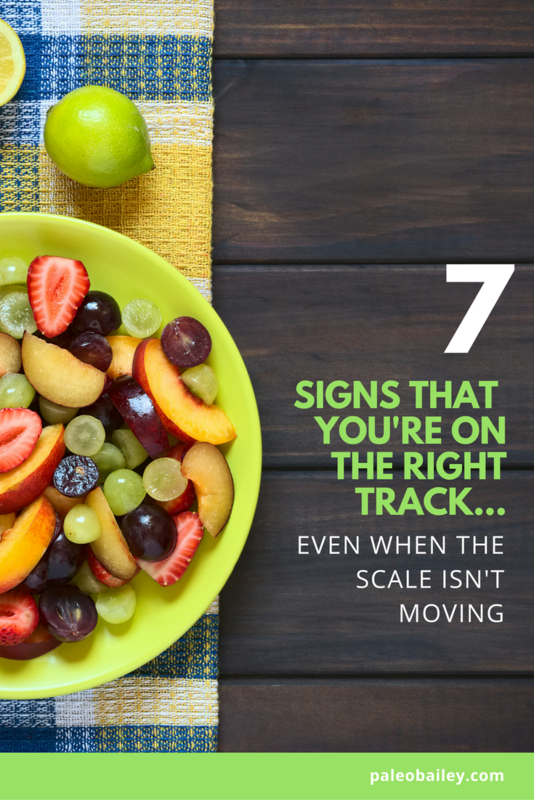 Here are 7 signs you’re on the right track even when the scale isn’t moving. We’ve all heard the line, “it’s not about the number on the scale”. And while it’s not and you’re much more than that number, I’m also not going to pretend it’s not an important factor. When that number is high, we know it’s negatively affecting our health, so yes, to a certain extent, that number does matter. Which is why it’s such a motivating factor for so many of us who are trying to drop a decent amount of weight off our frames – so we can be in better health. 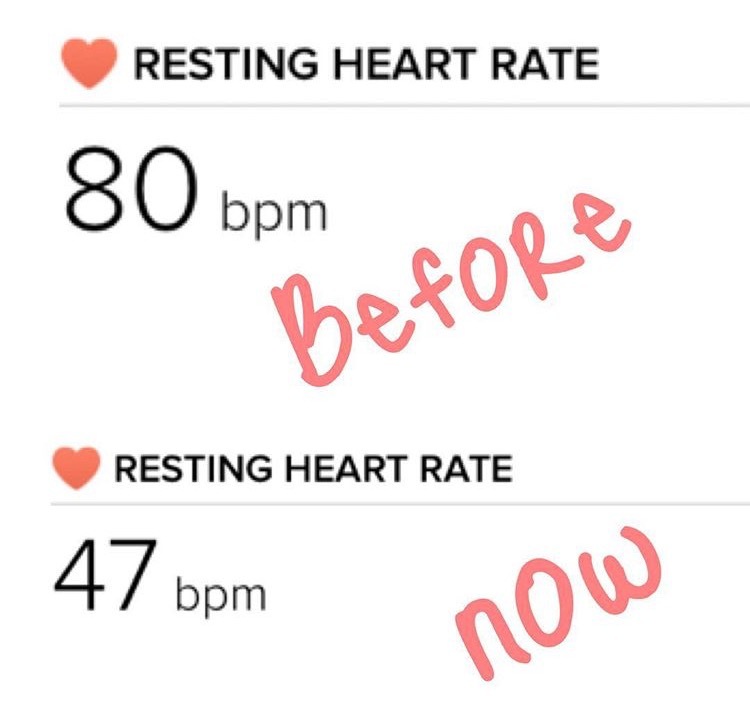 I’m also not going to pretend that seeing that number go down isn’t a huge source of motivation to continue chuggin’ along on the health train. It’s finding other rewarding sources of motivation that you need to keep going that can be the challenge. So what about when you’re doing every single thing “right” and still not seeing the number on the scale moving in the right direction? First of all, it happens to all of us. You’re not alone. Secondly, it doesn’t mean you’re not awesome. It doesn’t mean you’re less worthy of anything. It doesn’t mean you should let that discourage you – even though, let’s be real, when you’re used to seeing consistent losses, a stall is hard to deal with mentally. What it does mean when that happens and you’re finding yourself disappointed or wanting to say, “screw it”, is that you’ve got to look for other signs you’re making progress. You’ve got to recognize other noticeable changes happening in your body. You’ve got to hold on to the fact that you’re still choosing to better yourself and still becoming healthier each day you do. Regardless of what the scale has to say. When I hit a plateau, I’ve learned to get out of the ‘scale above all’ mindset and celebrate my body for other reasons. 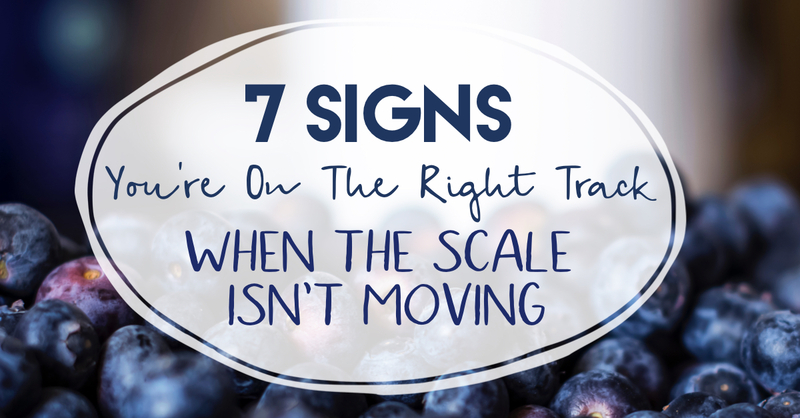 Here I’m sharing all of my tips on how to know you’re on the right track even with the scale isn’t budging. Even if you’re not losing weight according to the scale, it doesn’t mean you’re not losing body fat. I can’t tell you the number of times I’ve been showing zero scale progress but dropping jean sizes like crazy. I know for fact this is true for a ton of other people too. Sometimes we go through periods where we lose inches instead of weight and that’s a huge victory and just as much a sign that you’re on the right track as losing those lbs are. Or you’re getting faster. You’re hitting new PRs in the gym or on the pavement. You’ve never felt so strong and in control of your body. You’re waking up feeling more lean and healthy than you ever have. Don’t let that scale stop you! You know you’re making progress so don’t let the scale be the only form of measurement you rely on here. Take pride in the fact that you KNOW you’re getting healthier. 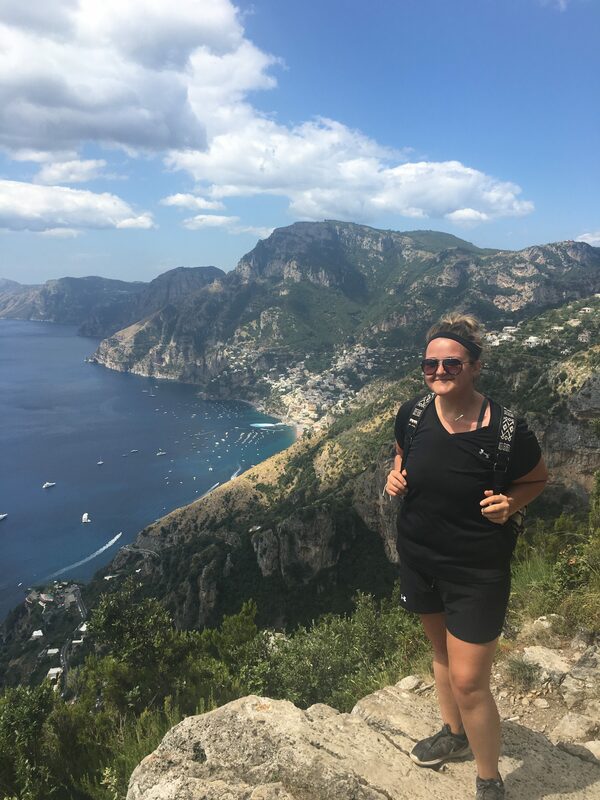 Check out my history with exercise & how I first started! 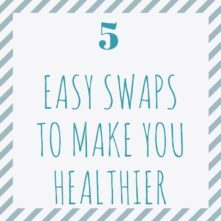 Getting your healthy food habits under control is a big gigantic step in the right direction. 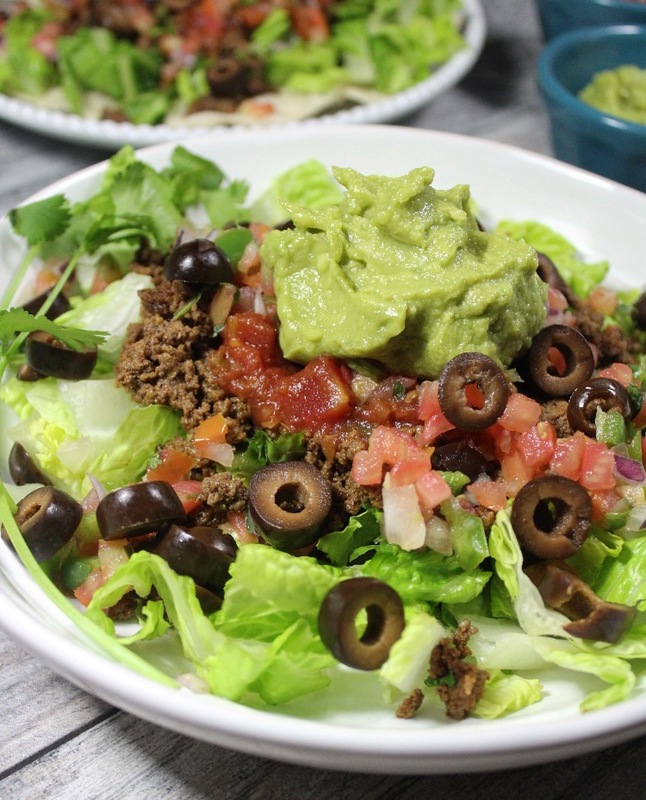 Recognizing that your tastes are changing, you’re enjoying healthy foods and actually *gasp* looking forward to your plate full of veggies is a major non-scale victory. Not reaching for a Hershey’s bar every day because you’re not even craving them (!!) is one way you know you’re heading in the right direction. Hopping right out of bed in the morning feeling refreshed isn’t something that everyone in the world experiences. I think the last study I read said the average person hits their snooze button 3 times. So when that starts happening, you’ll know you’re doing right by your body and are certainly on the right track to better health. Not getting sleepy mid-day or having that “I can conquer the world” type energy should tell you that regardless of what the scale says, you’re killin’ this whole “getting healthy” thing. Huffing and puffing your way up the stairs is a thing of the past. You’re no longer exhausted and sweaty after doing simple household chores and mowing the lawn doesn’t require a nap afterward. Little things like these are things that some people who’ve never experienced weight issues wouldn’t ever think would be something that’s “rewarding”, but when you’re getting healthier and losing weight, you DEFINITELY notice them. 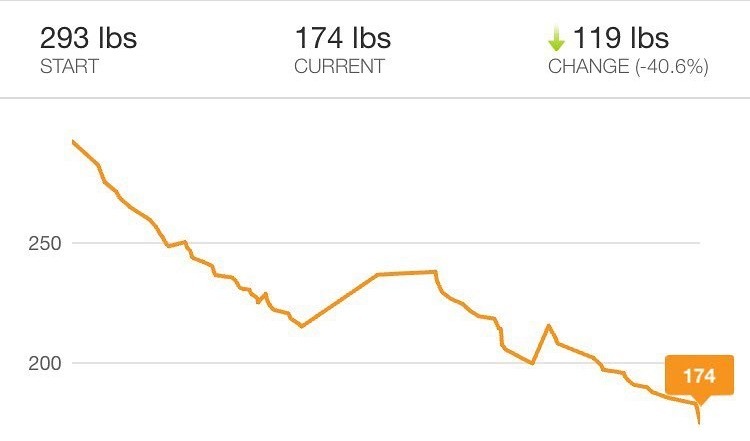 One thing that I’ll never forget was when I got out of my car without struggling or pushing off of anything and realized, “oh, hey, I haven’t ever done THAT before!” It’s the little, everyday victories you should hold onto when you’re not seeing the scale go down because you know you’re getting closer and closer to living your healthiest life. The scale can’t and shouldn’t have any power over how you feel about yourself. When you finally start feeling good in your own skin, don’t let that number tell you any differently. Getting healthy and losing weight takes getting a ton of moving parts into gear and one of the side effects of eating a healthy, wholesome diet is more confidence and feeling more empowered to be yourself. A lot of us have a tendency to let our mood for the day depend on what we see on the scale in the morning right when we wake up. Please don’t let it! 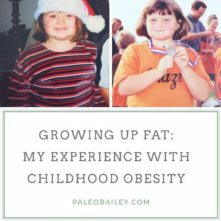 One of my favorite things that weight loss brought me was a newfound sense of self. I feel more me than I ever have in my whole life and it’s not the NUMBER that gave me that. It’s that I now know I am capable, powerful and in control of my life, choices, happiness, you name it, I OWN the control buttons over it. THAT’S what gave me confidence, not what the scale said before I even got a chance to start my day. The number can fluctuate day by day and week by week, that new sense of self I have can’t. Don’t let the number decide if you have a good or bad day – you decide that! This is a big one. Even if you haven’t lost a pound in a month, you can and should celebrate the fact that you’re choosing yourself and feeling awesome because of it. Once you add all 6 of these signs you’re on the right track together, chances are you are going to be feeling on top of the world. Your clothes are baggy, you’re running easier, resting better, knocking things off your to-do list like a champ, walk into a room like you own it, you’re trying new things because your confidence can’t be shaken.. you just feel GOOD. Not losin’ a pound but having the time of my life! Taking care of yourself improves your life in so, so many ways and all of those ways truly are completely unrelated to a number. While it is ONE tool to measure success and progress, never lose sight of the fact that it is never the only way. Stay the course and rely on these other signs you’re on the right track when that stubborn scale tries to tell you otherwise! 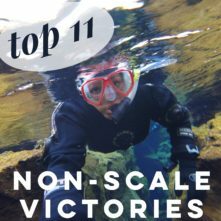 For more on non-scale victories, check out my most favorite ones! One Pan Creamy Chicken and Veggies: Dairy-Free, Low-Carb, Paleo and Whole30!